UK’s Markit construction PMI declined yesterday and today trader are waiting for Markit/CIPS UK Services PMI. 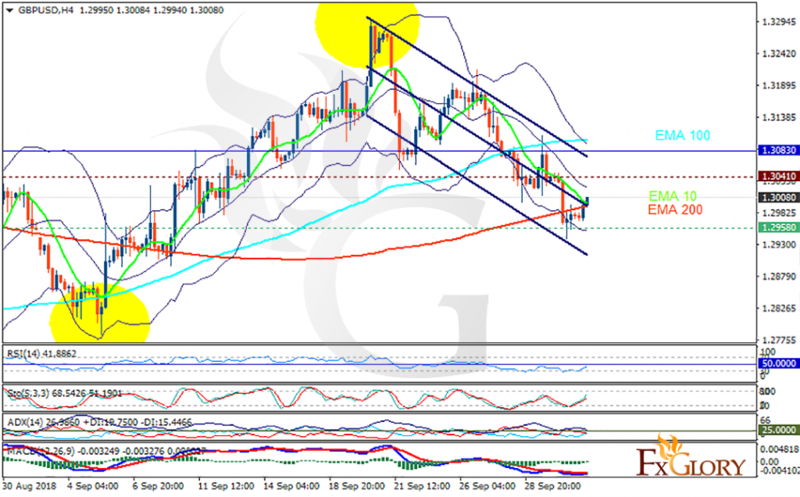 The support rests at 1.29580 with resistance at 1.30410 which both lines are below the weekly pivot point at 1.30830. The EMA of 10 is moving with bearish bias in the descendant channel and it is above the EMA of 200 and below the EMA of 100. The RSI is rising towards the 50 level, the Stochastic is showing upward momentum and the MACD line is below the signal line in the negative territory. The ADX is not showing any clear signals. The indicators are showing mixed signals. GBPUSD may probably fluctuate within the lower and upper Bollinger bands.